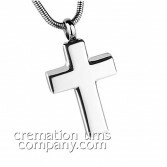 Stainless steel is a fantastic material from which to make cremation ashes jewellery, as it is known for being strong, durable and reassuringly permanent, and this is just what we like to hear when we intend to keep precious ashes inside. These amazing designs are exquisitely finished, and they make stunning keepsakes that you will love to wear for their own sake and yet knowing all the while that you are carrying a tiny memorial to a departed loved. Great care was taken in selecting this stunning range of ashes jewellery and with both contemporary and classic styles available we are certain we have catered for all tastes. 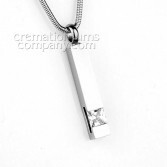 The Infinity No1 Ash Pendant is a beautiful piece of cremation jewellery (photographed with a snake chain) crafted from timeless stainless steel and finished in a classic style with simple engraving, mirror polished surface and a border encrusted with clear crystals. 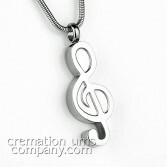 The Infinity No2 Ash Pendant is a beautiful piece of cremation jewellery (photographed with a snake chain) crafted from timeless, polished stainless steel and finished in a unique treble clef design. 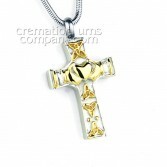 The Infinity No3 Ash Pendant is a beautiful piece of cremation jewellery (photographed with a snake chain) crafted from timeless, polished stainless steel and finished in a beautifully simple crucifix design. 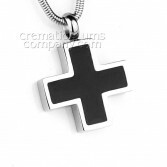 The Infinity No4 Ash Pendant is a beautiful piece of cremation jewellery (photographed with a snake chain) crafted from timeless, polished stainless steel with a black centre and finished in a stunning cross design. 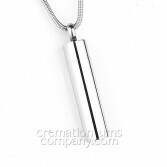 The Infinity No5 Ash Pendant is a beautiful piece of cremation jewellery (photographed with a snake chain) crafted from timeless, polished stainless steel and finished in a simply stunning plain cylinder design. 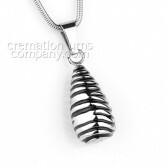 The Infinity No6 Ash Pendant is a beautiful piece of cremation jewellery (photographed with a snake chain) crafted from timeless, polished stainless steel, decorated with irregular black bands and finished in a simply stunning tear drop design. 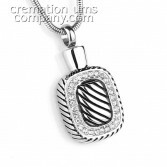 The Infinity No7 Ash Pendant is a beautiful piece of cremation jewellery (photographed with a snake chain) crafted from timeless, polished stainless steel and set with a single large clear crystal. 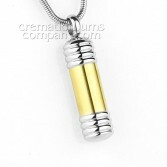 The Infinity No8 Ash Pendant is a beautiful piece of cremation jewellery (photographed with a snake chain) crafted from timeless, polished stainless steel, it has a brushed gold coloured body and polished stainless ends finished with a reeded design. The Infinity No9 Ash Pendant is a beautiful piece of cremation jewellery (photographed with a snake chain) crafted from timeless, polished stainless steel, and decorated with polished gold coloured Triquetra and a Claddagh emblem at its centre. 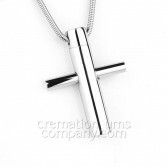 The Infinity No10 Ash Pendant is a beautiful piece of cremation jewellery (photographed with a snake chain) crafted from timeless, polished stainless steel and finished in a beautifully simple crucifix design.